BRICK Ceramic + Design Studio provides an affordable shared studio space, and a fully operational ceramics studio and gallery. Experienced artists are encouraged to use our equipment during open studio hours and all artists and beginners are invited to attend our classes. The best way to discuss your project is via email or by visiting during our open studio hours. Experienced artists are welcome to come to Open studio sessions to work independently on clay projects. $25 fee per session includes 3 lbs of clay and initial bisque firing. Additional clay $1/lb. Second Visit to Open studio is $25 and includes glaze materials and firing in our cone 10 gas reduction kiln. All Projects must be picked up from our studio within 30 days of finishing. There is no storage allotted for open studio Members. Please look into our Membership opportunities for further access to our studio and storage. Valerie Grossman is a ceramic artist in Cleveland, Ohio and a graduate of the Cleveland Institute of Art '12. Her work can be viewed locally in several permanent collections including Convivium 33 Gallery, The Cleveland Institute of Art, and The Mandel Center for Nonprofit Organizations. Her latest Solo Exhibition, entitled Personal Indulgence, at 1point618 Gallery is available online at 1point618gallery.com. 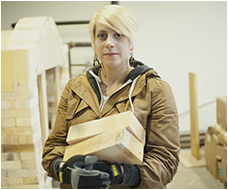 As an artist, Valerie creates sculptural and functional pieces that are a mix of glamorous and tough qualities. To view Valerie's work please visit her website at valeriegrossman.com.